Survivor: Redemption Island (2011) - 11th place, 8th out - 2nd juror. Voted out in Episode 10, "Rice Wars" (Day 27). Eliminated (in a duel) in Episode 11, "A Mystery Package" (Day 28). Cumulative totals: In-game - 27 days; Redemption Island - 1 day (1 visit). Redemption Island Ep.4 RC/IC: "Toolin' Around" - Digs up a hatchet, and Zapatera wins! Redemption Island Ep.5 RC/IC: "Smoko" - Sits out with Steve, Zapatera loses. 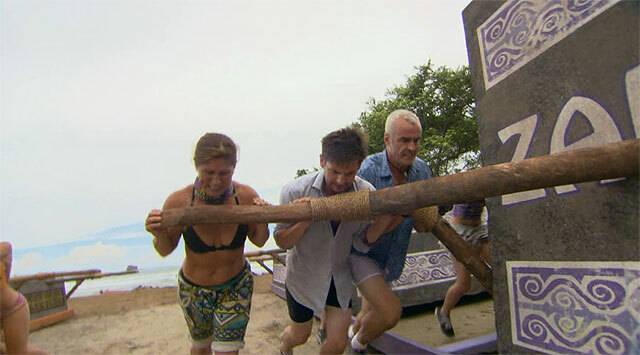 Redemption Island Ep.6 RC/IC: "Beach Balls"- Matches up against Andrea, makes no catches; Zapatera loses. Redemption Island Ep. 8 IC: "Rollerballs" - First person out, in the one-ball phase (12th/12). Redemption Island Ep. 9 (F11) IC: "Meso Soup" - Makes the second round, not the third (5th/11). Redemption Island Ep. 9 (F10) IC: "Gang Hang" - Second person to drop out, but at least competed (7th/10). Redemption Island Ep. 10 IC: "Mayan Pizza"- Makes it to the second round, but not close (tie-5th/9). Redemption Island Ep. 11 duel: "Survivor Shuffle Board" - Loses to Mike and Matt at shuffleboard (3rd/3). Redemption Island, Ep. 10: Six votes, from Rob, Phillip, Natalie, Ashley, Andrea, and Grant (voted out, 6-3). Gordon Holmes at XfinityTV.com (4/28/11): "Castaway Interview: Julie Wolfe"
Rob Cesternino at RHAP (4/28/11): "There's No Hiding from Survivor's Julie Wolfe"
Daniel Fienberg at HitFix.com (4/30/11): "Julie Wolfe talks Survivor: Redemption Island"
"Personal Claim to Fame: Winning the World Championship Outrigger Canoe Race in 1996 and 1998. The race is 41 miles long from the Island of Molokai to Oahu. Hobbies: Outrigger canoe paddling, stand-up paddling and motherhood. Survivor Contestant You Are Most Like: Ashley from Survivor: China. She was a strong outspoken woman whose mouth got her voted off the first episode. Reason for being on Survivor: To win a million dollars and make a better life for my daughters. I want to be a role model for my girls to show them they can achieve their goals and dreams."